The Solarize Wells Branch group has selected Lighthouse Solar as the installer for its group purchase! They offered a reasonable group pricing discount (better pricing than if you had vendors direct market to you). Their workmanship warranty was longer than most other vendors. They provided a strong hardware offering. They offered varied hardware options to handle different roofs. They have experience in handling group projects (they are doing installations for Solarize Gillespie County). They have financing available for $0 down. They are a strong company with a good history and reputation. Lighthouse Solar will be talking through their offerings with the group and will help everyone understand what options are available to each individual, based on specific roof space and energy needs. There are many reputable solar installation companies in Austin, several of which put in proposals to to the installations for Solarize Wells Branch. That Lighthouse was selected is a tribute to their fine work and a competitive proposal. Hopefully this is just the first of many solarize efforts in the Austin area and some of the other excellent solar companies in the area will soon have a chance to work with similar neighborhood groups. Anyone in Wells Branch or other north Austin communities that would like to join the Solarize Wells Branch group purchase must sign up by March 15, 2015. For those who aren’t Austin Energy customers, this deadline also helps you to sign-up for the Oncor rebate before that funding runs out this year. If you have any questions, visit the Solarize Wells Branch website or email solarizewb@gmail.com. 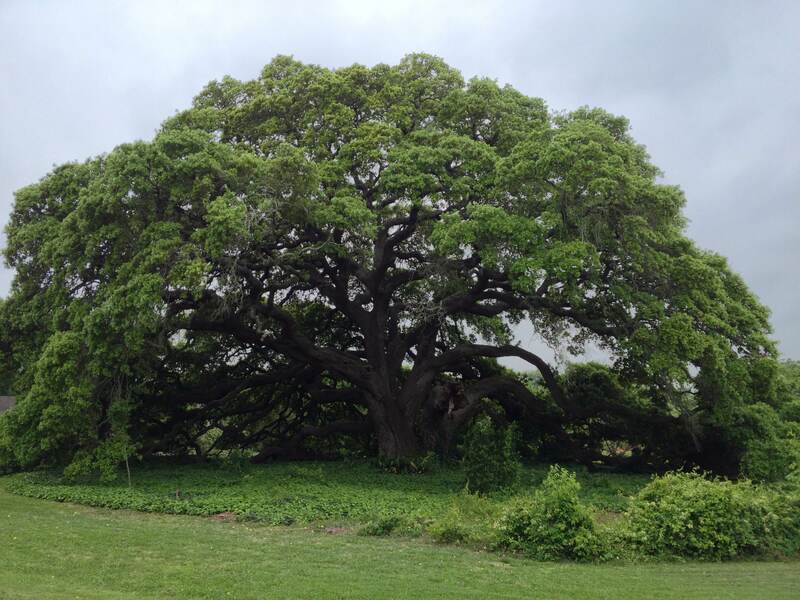 The biggest live oak tree I’ve every seen lives in on Doug Mach’s property in Flatonia, TX. On April 17th, the Flatonia, TX Rotary Club gathered to learn about solar energy. I’m not sure, but this was likely the first solar event ever held in this small central Texas town. The focus of the presentation I gave was the solarize model, but I also offered plenty of basic information about solar. I was invited to present to the group by Doug Mach, who turns out to be a relative by marriage, but I wasn’t sure how the rest of the group would react. Would people think I was a crazy environmentalist? Would they think I was trying to destroy their charming little town? I was very pleasantly surprised. The group of about 20 listened attentively and asked good questions. At least one attendee was already thinking about getting solar panels installed at his home. The City of Flatonia operates its own electric utility to serve residents who live within city limits. Flatonia currently has no solar installations, so even if only one resident there decides to go solar this year, it will be historic. The Flatonia Rotary Club also includes residents from outside city limits and they get their electricity from the Fayette Electric Cooperative, which serves a much larger area and does have a few customers with solar installations. If you live in the Flatonia area and want to learn more about solar, please contact me at kwhite@citizen.org.